Dreamwalker Dance Company, in association with Volcano Theatre, is bringing the 6th edition of The Whole Shebang to the Distillery November 23-25. 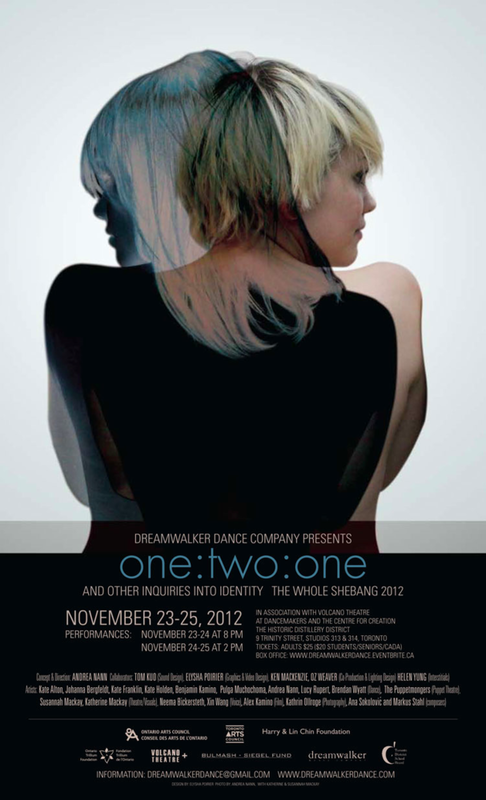 The Whole Shebang: one:two:one questions the notion of identity by exploring twinning, splitting, mirroring, and unison in an exciting and deeply immersive program. Using movement, sound, spoken text, video, puppet theatre and photography, a tremendous line-up of critically acclaimed artists will draw audiences into a creative exploration of how one becomes two, and two becomes one. The doors will close at 8pm to start the main program, but do come earlier! Some intriguing and fun art will start happening about 7:30pm. Andrea Nann (concept & direction), Tom Kuo (Sound Design), Elysha Poirier (Graphics & Video Design), Ken MacKenzie, Oz Weaver (Co-Production & Lighting Design), Helen Yung (Interstitials).